To say that GoPro has started a trend would be a true understatement. This brand has started an evolution of sorts that have taken outdoor photography to a whole new level. Giving users the idea to capture anything imaginable, under any type of situation, and even depth defying heights have taken photography and cinematography to a whole new level. Sure there are others, but the original in elite outdoor sport cameras have only gotten better with time while leaving the rest of the competition years behind. The original GoPro started it all, and since debuting a few years back we have seen technological changes which have helped make this brand purely the best. Users have been able to capture what used to be unimaginable while turning their experiences into lifelong memories. 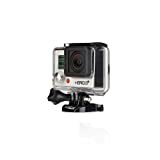 These cameras which have become extremely popular with extreme sports, water sports, and virtually anything to do with the outdoors should be owned by everyone, at least once. The following review showcases the Top 5 GoPro Cameras in 2018 for the Outdoor Enthusiast, extreme sports, and anything else imaginable. The HERO5 Black from GoPro has quickly become a best-seller, and why not considering it’s the best sports camera on the market hands-down. I don’t think there’s anyone out there who would refute this since it packs the ultimate punch and has become quite affordable. The Black model offers the perfect package of style and grace which will capture any moment of any height you can imagine. The HERO5 Black offers amazing 4K video recording and the still pictures are equally amazing thanks to the 12-megapixel snapper. High end features like single, burst, and time lapse allows you to customize your entire experience giving you a unique outlook every time you use it. Durable in nature and waterproof to a depth of 33 feet gives you versatility while not detracting from quality, at all. The GoPro Hero+ is a great alternative for those wanting an amazing sports, depth defying camera without having to break the bank to get it. 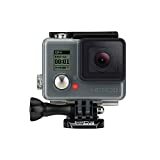 Coming in at just over $200 you get one heck of a deal which includes a Wi-Fi enabled GoPro. This model gives you everything you want to capture amazing still photos and video in full HD while making it easy to connect to other peripherals and share using Wi-Fi and Bluetooth technology. We’re talking about stunning video in 1080p which can record underwater and above. Waterproof to depths of 131 feet or 40 meters gives you the versatility and clarity of capturing some of the most amazing experiences. The 8MP camera makes still photography amazing under any circumstances and take advantage of the time lapse and burst modes for different experiences. The GoPro HERO comes in slightly less than the one above as you can pick one up for under $190. This is an amazing price for an equally amazing camera which gives you stunning HD quality video in fully 1080p. The immersive camera is a 5-megapixel variant which takes up to 5 pictures per second in Burst mode. Audio won’t be a problem as the HERO boasts an internal microphone which makes it great for capturing video and audio. The durability and versatility of GoPro’s have helped make them the #1 brand, and the HERO is no exception. You can take the HERO with you into the water to depths of 131 feet and has even been known to climb thousands of feet in the air. Complete with a micro SD card slot for extra storage, time lapse and burst modes, and is able to withstand even the harshest of weather extremes. Unfortunately, this model isn’t Wi-Fi or Bluetooth capable like the HERO+. 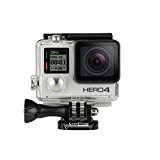 The HERO4 Silver is yet another high quality GoPro which gives you the same great modes we’ve come to expect, and is priced slightly less than other modes. The HERO4 boasts a stylish silver surround and boasts an easy to use touchscreen display which makes access to shot framing, playback and shot control easier than ever. Giving you video recording in full 1080p and amazing pictures with a 12-megapixel shooter which chews out 30 frames per second. The HERO4 Silver supports the GoPro App which allows you to upload to the Cloud for easy storage. You’ll also come to appreciate the Bluetooth and Wi-Fi capabilities which makes uploading and sharing with other peripherals quick and easy. The unique video trimming feature allows you to create clips of recorded video right from your GoPro. And rounding out the 5th spot in this review is the Silver Edition GoPro HERO3+. This amazing, stunning, and visually outperforming the competition sports camera takes extreme image and video capturing the next level. This sports camera is both affordable and one of a kind which features a 15% lighter and smaller housing then other GoPro’s. 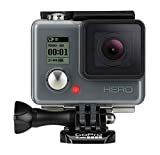 The HERO3+ Silver Edition holds nothing back as it’s packed with an image processor which is 2X faster than other GoPro’s which yields 1080p60 and 720p120 fps video. Of course, you’ll get waterproof capabilities to depths of 131 feet, 30% longer battery life, and low level light performance for those night time experiences. Hopefully, this review helps make your buying decision much easier as the above GoPro’s are the best models this year. Go ahead and see for yourself why GoPro has become the only brand to concern yourself with, and after you do be sure to come back and share your experience with the rest of the community.